Popping into Vinile in Milan means time traveling back to the era of vinyl. The front part of the large room is dedicated to lots of records, discs, books, magazines, turntables, cassette players (no joke!) and age-old radios. But there’s so much more to Vinile, than (obviously) vinyl on sale. Actually, it’s also a wine-bar breathing 70s vintage atmosphere out of all its pores and the founder’s passion for collecting all things music. The design is a quirky mixture of vintage furnishing, old movie posters and miniature comics figurines (remember R2D2?). Food- and drink-wise, there is a small but fine selection of simple, tasty finger food, craft beers, cocktail classics and Italian wines. During aperitivo time, Vinile takes you on a pleasant trip back in time, very relaxed and a bit nostalgic, allowing you to slow down – a casual, unconventional and very welcome exception to the rule of low-quality mass-feeding (not so) happy hours all around the city. To round up an already round thing, there are regular live music sessions featuring amazing tunes (electronic, indie), interesting musicians playing amidst happy listeners sipping a good drink. Feels like a living room concert, awesome! 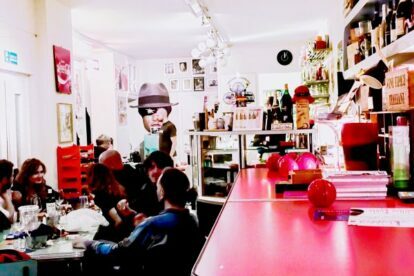 When there is no live act, the place is an oasis of relaxed pauses from the daily hustle and bustle, where people love to sit down for a while, read a book, chat with old and new friends (without the need to shout to be heard), or just look around. Love it, nothing less!